Hey friends! 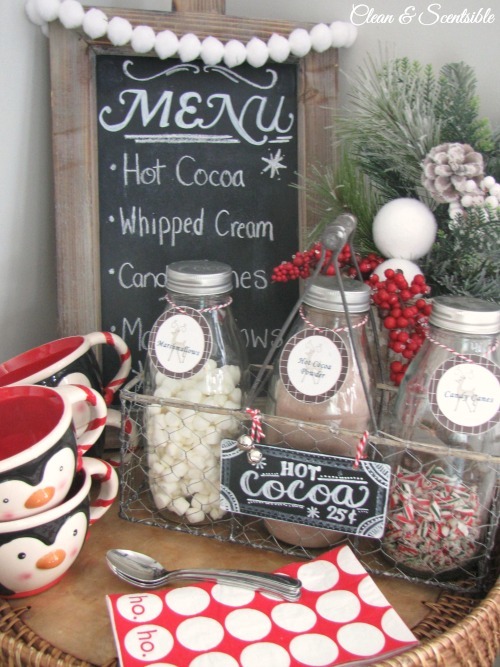 I have been continuing on with my mission to add a little Spring to our home and decided that it was time to say good-bye to our candy cane hot chocolate bar. It has been getting a lot of use, however, so I wasn’t quite ready to pack it all away. 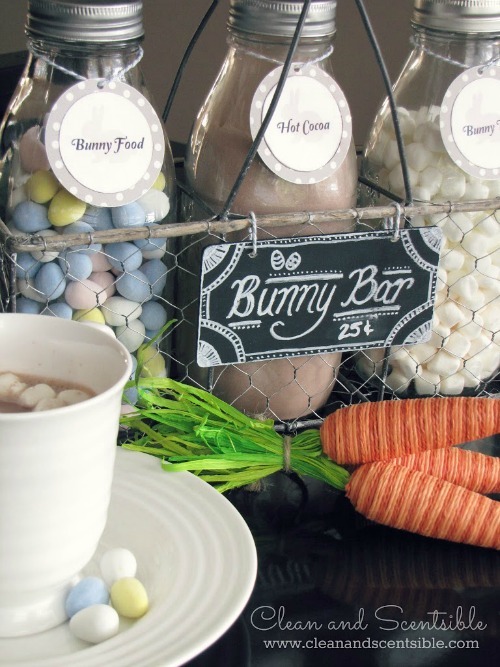 Instead, I turned it into an Easter hot chocolate bar that I like to call our “Bunny Bar”! …and I made some new bunny tags for the jars. It sure makes for a good cup of hot chocolate! Bunnies like hot chocolate, right? P.S. For those of you that have asked, I originally purchased the bottles from Decor Steals. 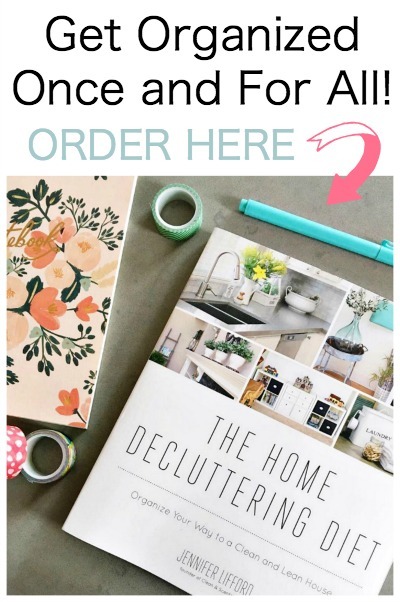 I searched around for you since you can no longer purchase them there, and have also found them over at Farmhouse Decor. I love the way you used the bottles and your carrots are just adorable. I wish I had the talent of some of you bloggers. I bet your kids LOVE that! How cute!!! Of course!! I don’t have the heart to pack mine up, either! Great idea and fun way to change it up a bit. I love the carrots! Did you make them? If so, do you have a link? This is one of the cutest ideas I’ve seen a a looong time. I love it. Made me smile deeply. Thanks! Too cute. Love how you changed it up! What a darling idea! I love any excuse to make a cute display for food/treats. I can’t wait to try this one. Thanks so much for sharing. Have a great day! OMG that’s the cutest!!! What a great idea! I would be eating those Mini Eggs every day. A little weakness of mine, UGH. You did a fantastic job. Really Sweet! Hopping over to say Hi- and I miss ya girl! I love this idea! I love how you updated this, Jenn! Adorable! I love it, hey chocolate milk…I wonder if that’s how they become chocolate bunnies, giggle. I’m hopping over from Anita’s to leave you some hugs! Very cute!! Great update , wonderful idea! 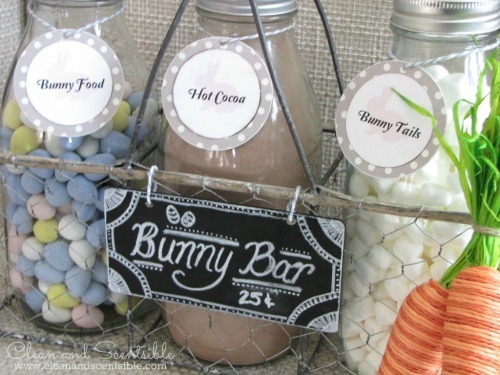 super sweet way to keep the cocoa bar going. love it!! Ok Jenn, this is ADORABLE! What a great gift idea! So cute! haha, I love the bunny tails!! What a cute idea! I love anything with hot cocoa and cute jars!! Hey Jenn! My name is Kinsley, author of Home | Styled, and I found your link on StoneGable! 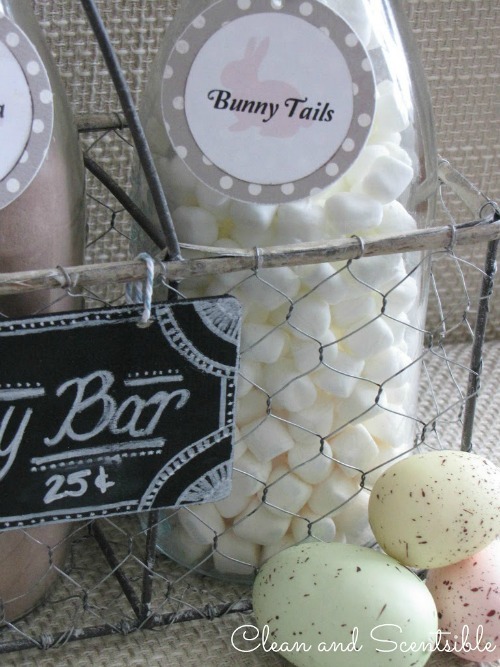 I’m always looking for cute decorating ideas for Easter specifically and I LOVE this! Thanks for the idea! 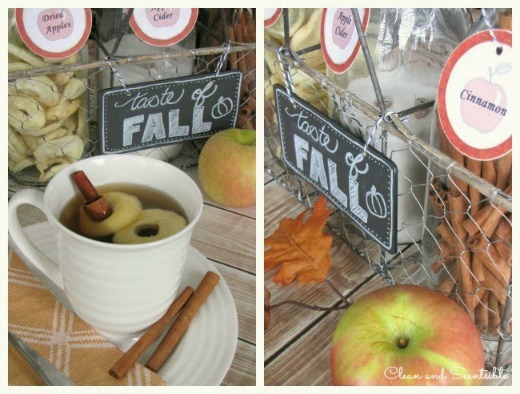 I loved your hot cocoa bar and I’m loving this one too! What a fun idea! So cute! I want to make this now!! Oh my, love this idea so much! The bunny tails are the cutest things! This is super cute! 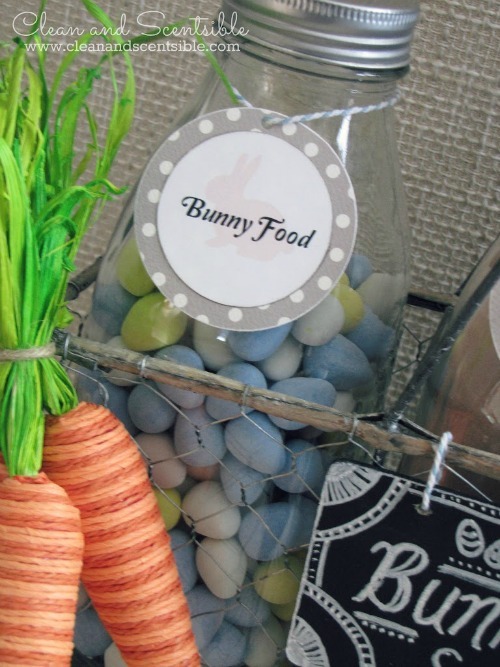 I would eat all of that “bunny food” because I love those little mini eggs. What a great idea! SO cute! New follower from Sarah Lynn’s Sweets! This is beyond adorable! I just found your blog by linking up today at Funday Monday and I’m SO glad I did! Darling idea! I love your little bottles and tags. 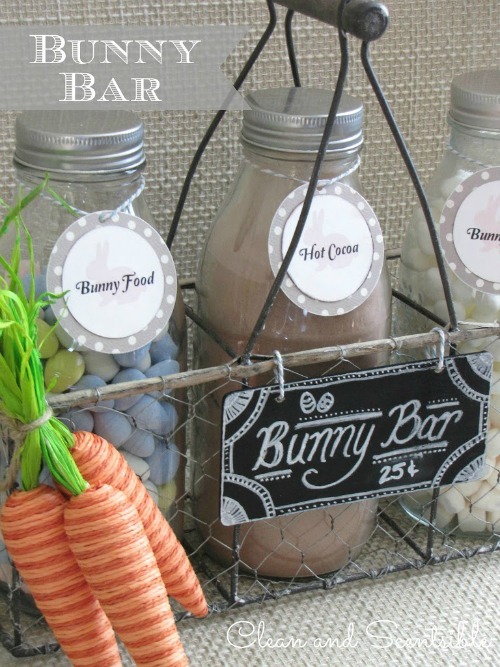 I’d love to pin this to my Easter board – such a fun idea! Very cute! Visiting from craft-o-maniac. So cute! I am not sure how long my jars would stay full though. I would eat them ASAP. 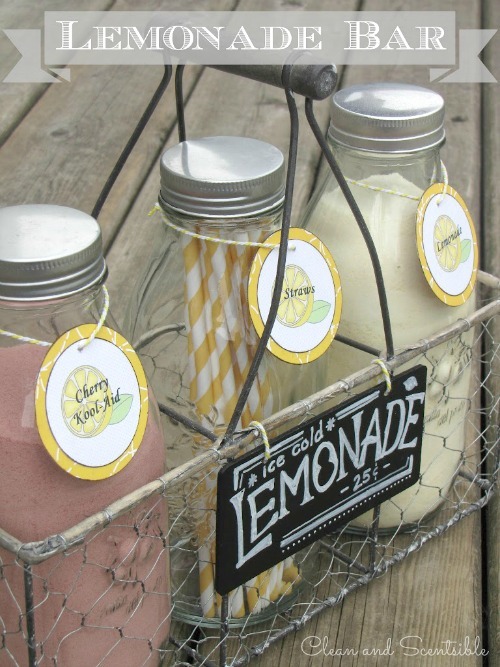 Such a fun idea for a chilly Easter morning! Cute, cute, cute! What a cute idea! Thanks for sharing it on Monday Funday! Oh my, these are absolutely adorable. They will make great gifts fore the person who has everything. Thanks Jenny! Hope you had a wonderful Easter!